A Great source for the elementary math classroom. 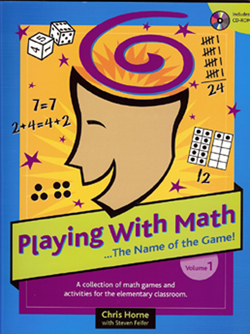 This book with a CD-ROM included includes math games and activities to enhance number sense, encourage acquisition of numbers combinations, and promote mathematical fluency for elementary aged students. The premise of each learning experience is to develop a conceptual understanding of mathematics in a fun, self-motivating, and intrinsically meaningful manner through the format of games and spontaneous learning activities.